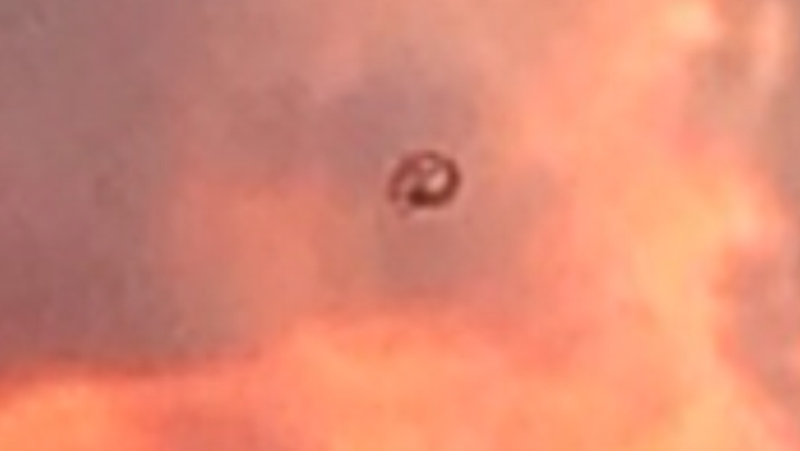 UFO sightings – These interesting photos were taken over Salinas in California on Tuesday, 17th December 2013.
on Cumulus clouds. Upon returning home and checking the photos out, I played around with the zoom feature to frame certain cloud features and colors. Surprised to discover object slightly right of top of picture frame. Video portion of sky taken not more than 5 min. Later 100yards further S. ( exactly 20yds into Monterey County from San Benito County line). knowledge and experience, chances are that you may actually be correct for once. ( Hey UFOs over Gilroy, you still looking up? ). Ill upload my pics and video as well as my zoomed pictures I have. Just a thought about our search for Intelligent life out there…….maybe they are finding things as difficult as we are??? i just watched your video and it looks like a piece of dirt on the lens of your phone, or a very small knick. As a photographer, beautiful shot of the sunset/sunrise, however you should clean your lens.